The large gently sloped property has 150 feet of waterfront with a large 50 foot swimming & boat dock that can accommodate three 20+ foot boats. One of the best views on the lake in one of the best areas. The house is located within a couple miles of a grocery, drug, sporting goods, and video stores; also the state boat launch. The Victorian town of Hawley, PA, is just another mile with it's antique shops, fine restaurants, stores, & live theater. This is the good end of the lake, The other end is narrow and can make a round trip to the store, an hour. (It's a big Lake) The area is just full of stuff to do from a Sports Fun Park and Animal petting zoo to paint ball and golf. On the calmer side there are nature walks, Triple W Ranch with horseback riding and The Lacawac Bird Sanctuary to name a few. Pets are permitted upon approval (well trained and house broken, no clawing or gnawing, crated). The Commercial Kitchen Has Restaurant Grade Appliances. Heated Slate Flooring in bath, Full High Speed Wireless Internet Access, lower great room with pool table , Foosball table , Darts, and 40x25 stone patio. The view of the lake when you walk into the house, is just beautiful. There was plenty of room for the 5 of us, and we loved our pool matches in the basement. Very close to Woodloch Spa, a great place to go and be pampered. A simply wonderful, relaxing weekend, and a great house to enjoy with friends. Nice vacation home, we enjoyed frozen lake and unique decorative stuff in the house along with games. We had given the stay at the lodge for a Christmas present to our kids and their spouses and families. We wanted to go away and just enjoy family time. This home was perfect for that. The lay out of the cabin is great because there are rooms that are large enough to be together but if you wanted to slip away for some quiet time there was a place for that also. The cabin is well equipped with everything you need for meal time. I had brought some cooking items I thought we may need since there were 11 of us but never needed to use them. Our stay was at the beginning of March so we weren't sure if we would be able to enjoy the outdoors. The lake was frozen and the littlest one of our group (6 years old) enjoyed walking on the ice and watching the fishermen drill holes in the ice to fish. Saturday afternoon we went to a local winery that was very nice. In the evenings it was nice to sit by the fire and play games. The family said this is a do-over. Next time we plan our stay it will be at this cabin but maybe when it is warmer so we can enjoy boating and fishing on the lake. The owner, Steve, was great. Whenever I had a question he was quick to respond to my emails and called right before our stay to make sure we had no questions. Without hesitation I would recommend staying at Windward Lodge. Everything my group expected it to be! The only disappointment came when we opened the Friends trivia game to find most of it missing. However, early 1980s Trivial Pursuit did not disappoint. The host (Steve) was very easy to contact and provided all info as needed. All business transactions and communication was top notch! Thanks for contributing in our super fun relaxing weekend! The property was amazing. We had 11 stay & there was more than enough room. The house is spacious, furniture is comfortable. Kitchen has everything we needed x 2. Beautiful view of lake with gorgeous sunrises. Met owner & couldn't do enough to accommodate me. Went out of his way to make sure I had everything needed. Looking forward to going back. 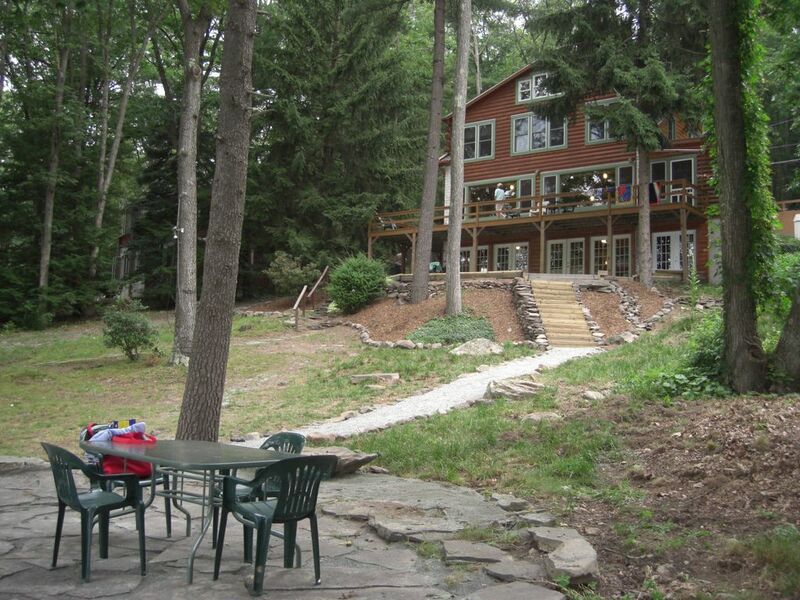 The house is large, cozy, well-appointed, and situated on a beautiful property. Steve, the host, is quick to answer any questions and is very amicable. My group had a great time cooking in the professional kitchen and relaxing on all the comfortable sofas. We would definitely book another stay here.